Assistant Manager- Our Clear Lake store has an opening for an Assistant Manager. Duties include; customer service, employee supervision, merchandising, opening/closing the store, computer usage,running the store in the absence of the manager and all other aspects of retail.Must be able to lift 75+ pounds on a regular basis. Need a valid driver's license with a good driving record. Dental and health insurance available. 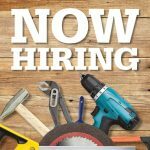 Sales Associate/Supervisor- We have a job opening for a full time Sales Associate/Supervisor at our Clear Lake location. Duties include; customer service, cashiering, merchandising, deliveries, supervising employees and all other aspects of retail. Must have a valid driver's license with a good driving record. Job includes lifting 75+ pounds on a daily basis. Dental and health insurance available. Cashier- Full time and part time. Some days, evenings and weekends.